Edward S. Curtis, an early professional photographer, created a large body of work featuring Native American subjects during the late 1800s and early 1900s. Curtis was more than just a photographer, he called himself an ethnologist and a “true friend” to Native Americans. Today, he’s often referred to as a photographer and anthropologist. Most early photographers confined themselves to formal portraiture in studios. Curtis created many formal portraits of Native Americans, but his interest in tribal culture drove him to chronicle their daily lives outside the sterile studio environment. The result of his interest is a vast portfolio of beautiful pictures that ranged from candid photos of people doing their daily chores to formal portraits of individuals in ceremonial garb. Curtis did not leave much info about his subjects; typically, he recorded their name, and occasionally, their location and the tribe to which they belonged. He may have been deliberately vague; he wanted to cause the least impact possible to his subjects. “Fortunately, taking a picture leaves no mark,” he told a friend. This photograph was taken in 1905, and is titled Ah Chee Lo, a Young Indian Child. I would guess that Ah Chee Lo was a boy, but it’s hard to tell from this photograph. I wonder what became of this remarkably beautiful child. Curtis, Edward S, photographer. Ah Chee Lo. , ca. 1905. Photograph. https://www.loc.gov/item/93502613/. Curtis photographed Medicine Crow in Montana a few years later. Other than being Native American, these two subjects are a study in contrasts. Ah Chee Lo gazes directly at the camera while Medicine Crow shows a dramatic profile. The child is dressed simply; the adult is in an elaborate costume with jewelry. Ah Chee Lo’s face is smooth while the visage of Medicine Crow is deeply lined. It would be interesting to know how old Medicine Crow was when this picture was taken. Maybe late 60s? Based on their attire, they appear to be from different tribes. Curtis did not record the name of the tribe to which Ah Chee Lo belonged, but the child’s clothing looks like a southwestern style. Medicine Crow was part of the Crow Nation, which covered territory in present-day Wyoming, North Dakota, and Montana. Medicine Crow, Crow Indian, Montana, head-and-shoulders portrait, facing right, hawk hide headdress, two earrings in right ear, disc ornaments, shell beads, beaded scalp shirt. Curtis, Edward S, photographer. Medicine Crow–Apsaroke. Montana, ca. 1908. Photograph. https://www.loc.gov/item/92521823/. This photograph of a Mohave woman was taken in Arizona in 1903. The woman is holding a little boy, presumably her son, and carrying water in a container perched on her head. From what we can see, the container looks as though it would have been very heavy. She is wearing loose, colorful clothing and her hair flows around her shoulders. Curtis did not record the names of the woman and child. Curtis, Edward S, photographer. Mohave Woman Carrying Water on Her Head and Holding Child. Arizona, ca. 1903. Photograph. https://www.loc.gov/item/90710180/. The rapid encroachment of settlers into what had been land shared by native people was making profound changes in the Indian way of life. The relationship between the Native Americans and the newcomers was tense and at times hostile, and the native people were seldom portrayed positively. Edward Curtis’ photographs betray a real affection for the people and an appreciation for their vanishing way of life. His work is among the best records that exist of the native people and their cultures. Curtis lived until 1952, long enough to see the country transformed, and to understand the great contribution his pictures had made toward documenting the nation’s history. 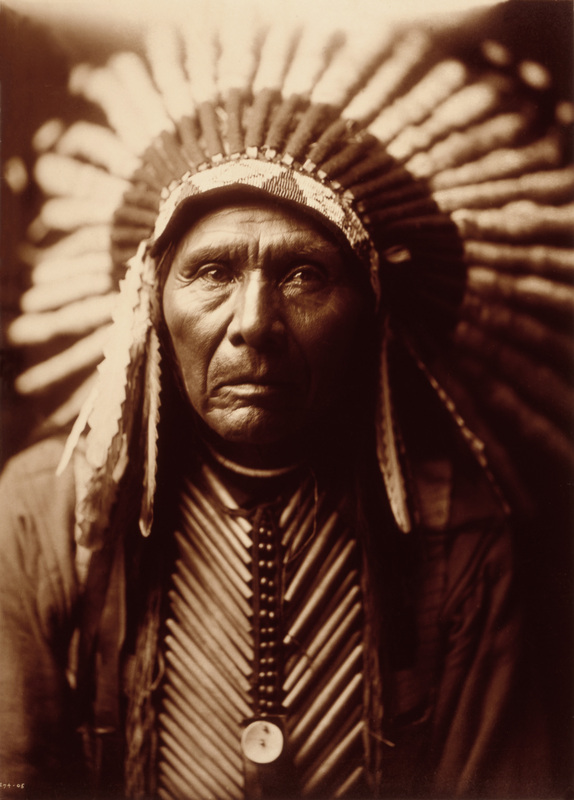 You can view more of Edward S. Curtis’s work on the Library of Congress website at http://www.loc.gov. Note: The man pictured at the top of this post was named Three Horses. Curtis photographed him in 1905.